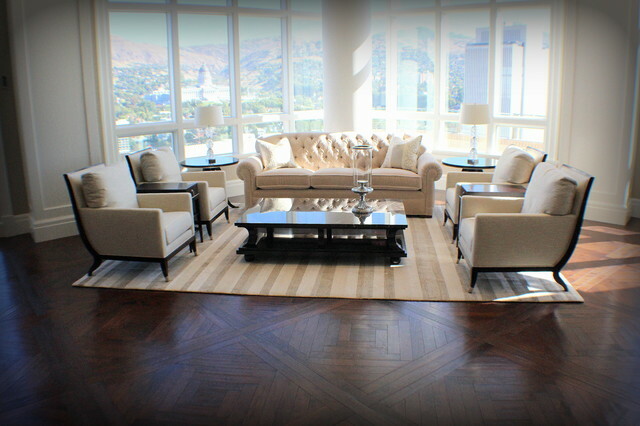 Walnut Floors Anchor Sky High Condo - Traditional - Living Room - Salt Lake City - by Signature Floors, Inc. Acres of hand-textured, oil finished Walnut parquet flooring provide a grand scale foundation in this elegant living area. Kudos, as always to our partners-in-trade, Richard-Marshall Fine Flooring, manufacturers of this incredible product. City Creek Condos. Salt Lake City, Utah.